The Rancho RS5000X series design includes patented progressive rebound and compression discs. At lower speeds or in the earlier stages of the shocks travel, an eccentric disc in the valve shim stacks will engage the valving at lower frequencies, helping to control the energy of motion as the cycle of the shock increases or decreases in its action. When hitting a pothole, off-road trail obstacle or similar activity, Ranchos Progressive Engagement Valving allows for early flow of fluid, helping to reduce harsh initial impacts and to control the flow of fluid in a progressive, gradual manner through the valving. During on- or off-road driving activities like wash boarding or when travelling a rough fire road, the early flow of fluid helps to minimize a rough ride as the piston movement is able to glide through the initial travel motion of the shock with minimal ground impact or force. If needed, the Progressive Engagement Valving will further engage to maintain control and stability. 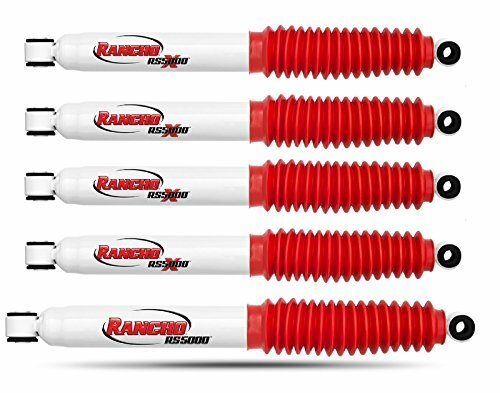 // Rancho RS5000 Steering Stabilizers are a simple and affordable way to enhance a vehicles performance. Rancho Steering Stabilizers are ideal for off-road driving, towing, and street applications. The steering stabilizers reduce wheel shimmy, bump steering, and vibration as the shock series was engineered for vehicles with oversized tires and wheels. Steering stabilizers can help reduce on or off-road driver fatigue. Rancho steering stabilizers are built from the foundation of the RS5000 series shock absorber.